If I asked you what does mental health mean to you...what would you say? I actually did ask some random people to define mental health and the result was not only confusion on their part, but quite a few defined it as what it is not...not what it is. We hear the words mental health, mental well being, mental health matters a lot ...but what the heck does it mean? I think a good way to explain is to think of a tripod. A tripod has three legs and it not only supports a camera but it maintains its stability so still pictures or long exposure pictures can be taken without sacrificing the quality of focus. "Mental health is all about how we feel, think and act." 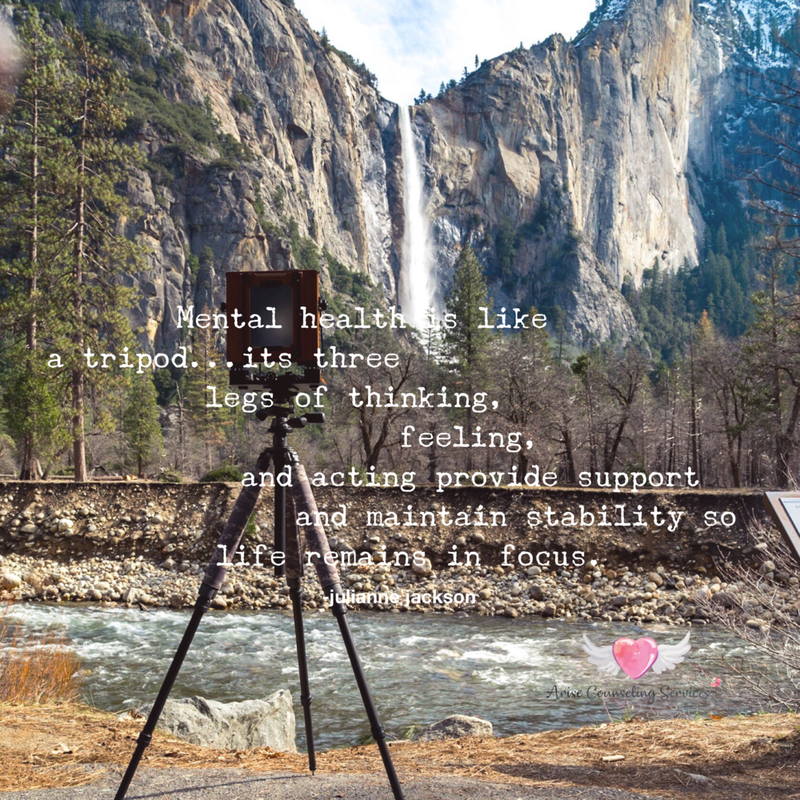 Mental health can be thought of as a three legged support ...emotional, cognitive, and behavioral...that keeps us stable and in focus. In other words mental health is all about how we feel, how we think, and how we act. The World Health Organization defines mental health as "a state of well-being in which every individual realizes his or her own potential, can cope with the normal stresses of life, can work productively and fruitfully, and is able to make a contribution to his or her community." Mental health is an important component of well-being that is applicable to us all...at every stage of life from infancy through adulthood. How do we maintain good mental health? The answers are as unique as each person asked; suggestions sound very much like how some might describe self-care. Self care of our feelings, our thoughts and our behaviors. "What are good mental health practices?" So what are some good mental health practices? Being aware of our needs and feelings...talking with friends...sharing feelings...connecting with others...staying hopeful in our thoughts...relaxing...finding a balance between work and play...helping others...getting restful sleep...developing healthy coping skills...contributing to one's community...just to name a few. As a mental health counselor, I believe it's time to shelf our negative definitions of all that mental health is not and begin openly discussing its positive characteristics. How we can help to incorporate better mental health practices at home, in our workplaces, and in our play across the many aspects of our lives and with all ages of people? It all begins with a bit of education that helps to set our focus straight. Is how you are currently feeling, thinking and acting troublesome to you? Talk therapy is an effective means to fine tune your mental health. Call Arise Counseling Services today at 251-216-9653 or go here to schedule a free 15 minute consultation call to learn how to stabilize and get your life more in focus because yes...mental health matters!